White sage has become a favorite plant of mine. It is elegant and grows well in my yard. I have wanted to focus some posts on specific plants for a while. So, this post will be looking at white sage and my experience with them. One of my white sages; this one is two years old. I have chosen a number of sage plants to go in my native plant garden mostly due to reports of their fragrance and easiness to grow. Both seem true at this point. 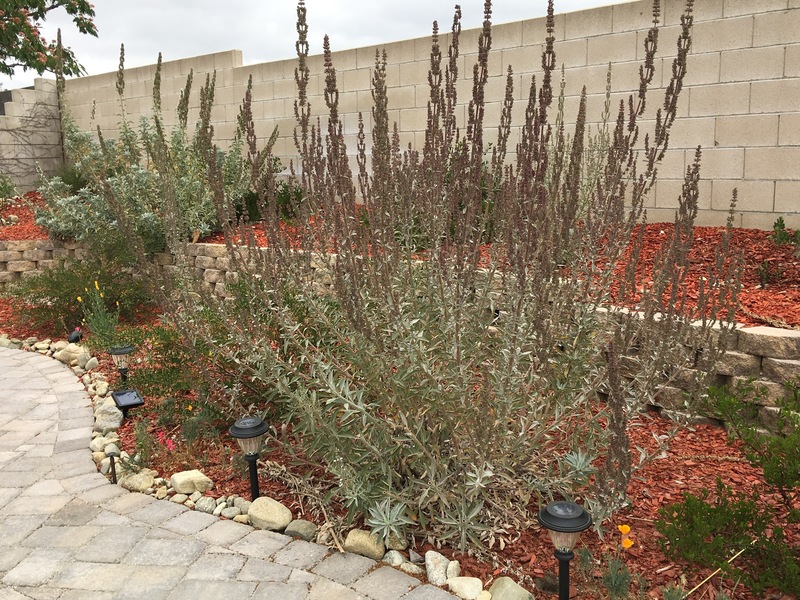 As the picture above shows, I have a couple of white sage plants in my yard. Bees and hummingbirds love them. And, when they are doing well, they produce tall flower “wands” that shoot up over five feet tall. This one pictured is at least six feet tall in the highest stalks. They have dealt with extreme heat. We regularly get temperatures over 100 degrees in August. And, last year was extremely dry. As it was the first year, I supplemented its water supply heavily. For the first year, I watered daily during the summer. I dropped the frequency down during the fall and stopped watering once the rainy season began this last October, unless it was still dry out. This summer I am watering about once per week, or so. I have two other white sages that were pretty small for a while there. In fact, they still aren’t as big as the one above. But, I started watering them more and they got much bigger. So, early on, I would say that white sage enjoys a good amount of water. But, I have read that watering them less after the first year or two is a good idea. That seems true. But, I haven’t had the trouble with them being stressed from too much water like I have with my ceonothus plants. Close up on white sage blooms from my back yard. 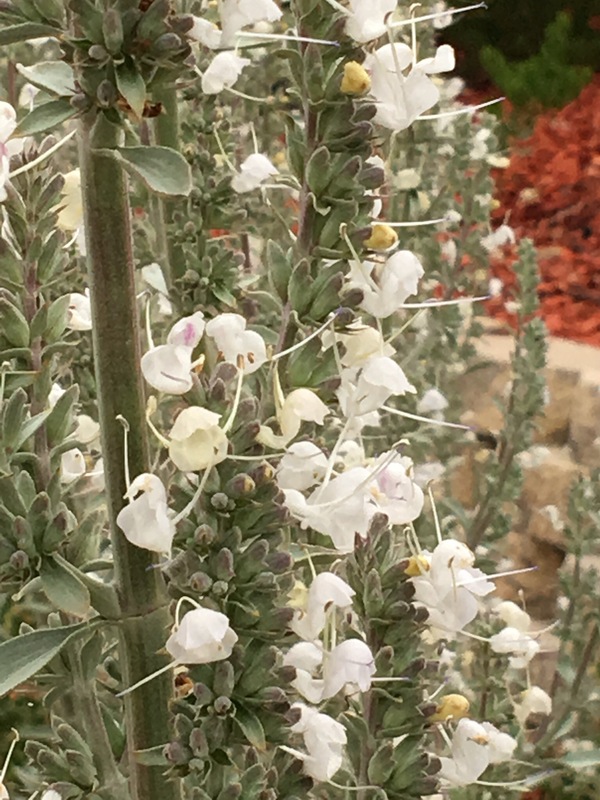 When white sage is in bloom it is a beautiful, very stately plant. The stalks of white flowers seem somehow heroic to me, rising skyward in defiance of gravity and serving as a beacon to birds and bees. I’m of the understanding that the stalks can be harvested and dried to make smudging sticks for Native American rituals, but I have not done so myself. I may give it a shot this year. My soil is mostly loam but very rocky and layered. The first six inches, or so, is loamy sand. Below that is a lot of rock, majority granite, in potato-sized chunks, but there are some much larger rocks, too. I’ve pulled out quite a few that are over a foot wide and weigh what feels like over thirty pounds or more. That layer goes on for about a foot or two. Sometimes there are pockets of clay or sand. After the rock layer, there usually is a layer that is sandy and rocky. I’ve never dug down further than about 3 feet, so I’m unable to attest to more from my own experience. I planted these sages from pots I bought at Grow Native Nursery in Claremont, CA (at the Rancho Santa Ana Botanical Gardens). They were all quite small, most in gallon or smaller pots. I dug holes that about twice as wide and deep as the pots themselves. I filled the holes with water twice before installing the plants. Then, I made sure the base of the plant was about one inch or so higher than the surrounding dirt. I buried the roots and packed the dirt slightly, just to get rid of air pockets, but not so much to avoid inhibiting root growth. I watered almost daily in the beginning. No fertilizer. Mulch is good, though. Overall, I recommend this plant. I currently have eight of them. I just planted four this fall. Two of those already produced flower stalks! They are already significantly larger than when I planted them. So, this plant grows pretty fast. And, it can easily spread to 5 or 6 feet wide, so keep that in mind. The leaves are a light-green, near to silver. They offer a nice contrast to darker foliage. One of my white sages died, I think from a gopher. Another got a pretty bad bug infestation that seemed to kill a lot of leaves. The plant itself is still alive and producing new leaves and stalks so I’m keeping an eye on it. Not much I can do for it, though. I’m trying not to use anything stronger than Neem oil on my plants. I am going to try raising some from seeds if I can figure out how to harvest them. I’d be interested to hear from readers if they have questions about the white sages or experience with them. Thanks for reading! Previous PostProgress Update June 2017Next PostNative Plants… So Hot Right Now!